I'm tied pretty close to our house these days, since I need to take our dog with me if we get a call for a realtor to show our house. I have been enjoying sitting around reading blogs but wishing I had the opportunity to go look for a piece of furniture to transform. Then, when I pulled my car into the garage the other day, I realized that I had been overlooking the OBVIOUS. Still it has been such a loyal appliance and has been with us since before our children were born! So, I got to thinking that you are supposed to be able to paint ANYTHING with Annie Sloan Chalk Paint. I still had plenty of Country Grey from other projects. 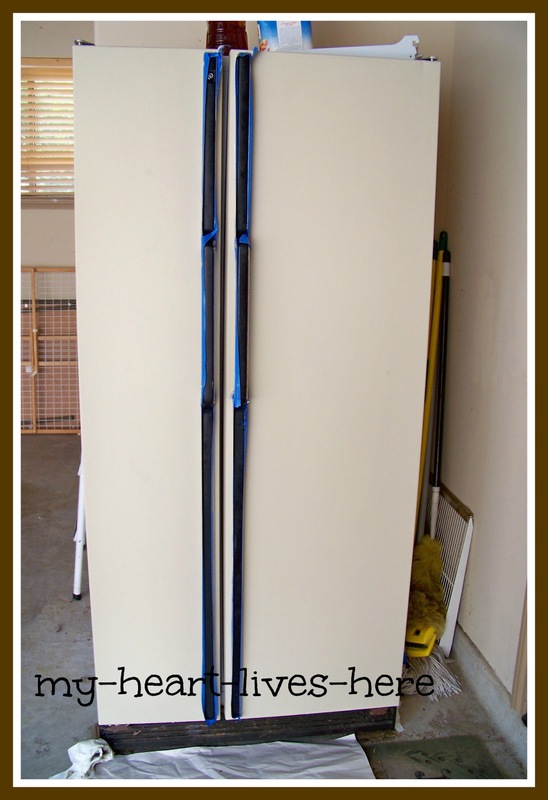 So, I just wiped the dirt and flakes of rust off the front of the doors, taped the handles, and began to paint. I was delighted with the coverage. 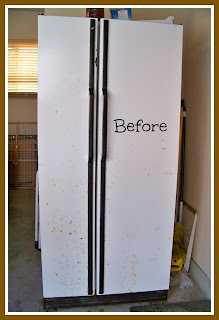 Of course it is a flat paint look, but it did a great job of filling in the rusty gaps. However, it reminded me a little too much of the "almond" appliances that my mom had in the 70's. 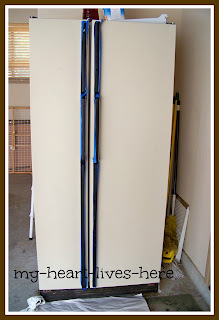 So, I decided to paint the handles after all. (I also hated the spots that remained on the chrome on either side of the the black plastic handles....) Time will tell whether the paint holds up on the handles, but for now it looks much better and I can always touch up paint. 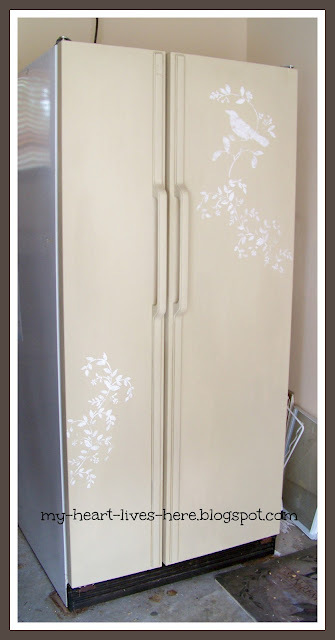 Once the whole fridge was country grey, I wanted to add a little finishing touch in keeping with the new look. So, I used stencils of a branch and a bird to sponge on white paint. I finished off the project with clear wax. I can't wait to bring it back inside! I must add that I only did this project because the doors were in such bad shape. 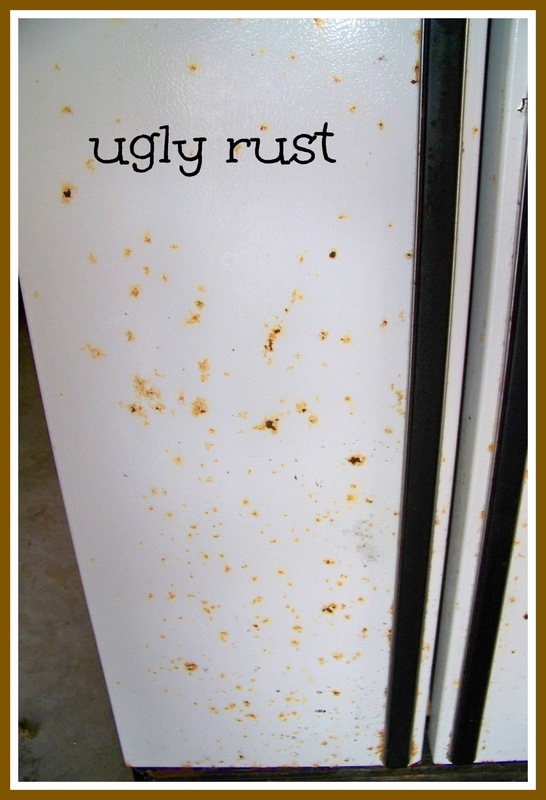 I would not have painted over a perfectly good refrigerator! 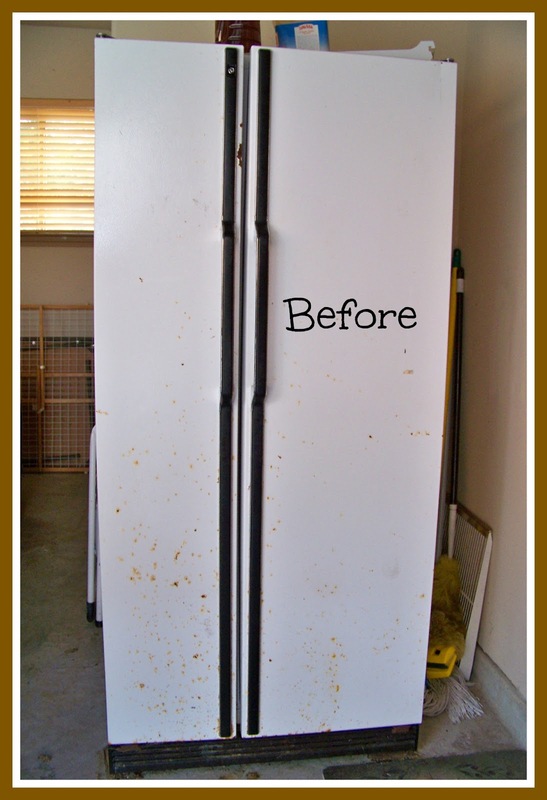 I've seen some 'fridge makeovers before...but this one is SOOO CUTE! 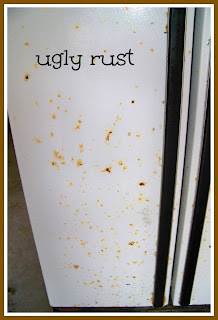 If I had an old yucky fridge that just kept on running...I'd do this in a heart beat.